Of all of golf’s many attributes, I think the greatest of them all is the incredible number of fascinating people that we meet, and play the game. In my case, and because I’ve made the game my profession, I’ve been extremely blessed with meeting virtually thousands of people from all walks of life, from the common person, to some of sports all time superstars. 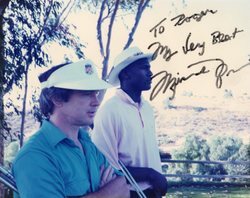 One of my most memorable moments came one day when I was playing golf with NBA legend, Michael Jordan, arguably one of sports greatest icons. Walking off the tee of # 11 at Bel Air Country Club, Michael was 3 under par and playing great – and was in an even greater mood. He turned to me and said, “Ya know Roger, I just wish I had started this game when I was a kid, I really think that if I started young enough, I would’ve had a good chance to make it to the PGA Tour”. Somewhat surprised, I asked him, ‘Let’s say that “if” you would’ve started the game that young, and “if” you had gotten good enough for the tour; what sport would you have played, basketball, or golf?” He looked at me for a second, thought about it, and then replied, “Ooh, that’s a tough question man, I don’t really know”. Think about it. Here’s one of the most acclaimed Super Stars of all time, and he wasn’t sure if he would’ve hypothetically traded his phenomenal career for that of a career in golf! To me, that says it all about this game; and is another reason that we should keep ourselves fit so that we can play it for a lifetime.